I started with the idea from Order of the Opus Gluei for this card. This set of stamps in my stash came to mind and this pad of pattern paper. I looked around for a sketch and since I haven't played at Tuesday Morning Sketches for awhile I decided to see what Melissa was hosting this week. I put the picture of the sketch here so you could see that where Theresa has boxes I put animals, so it's in the spirit of the sketch if not exactly. I shopped my stash for long unused embossing folders and came up with the Tiny Mosaic for the aligator and the spider web embossing folder because we all know there are giant spiders lurking in the jungle. 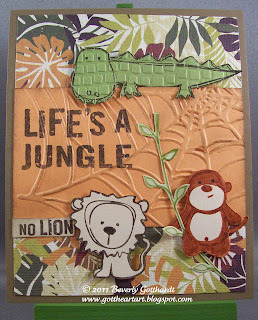 Supplies: 4 1/2" X 5 1/2" Soft Suede card blank, Papers: DCWV-Safari Chic Stack, SU-Soft Suede, Peach Parfait, River Rock, Old Olive, tan unknown, Stamps: CTMH-D1285 Life's A Jungle, Autumn Leaves-Mindy's Zoo, Ink: SU-Cajun Craze Old Olive, Early Expresso, those colors in the markers also, Cuttlebug embossing folder-Tiny Mosaic, SU-Textured Impressions Spider Web, SU dimensionals. Very cute! Thanks for joining us at TMS. This is adorable. I love that you shared your process with us. Those critters are perfect. Great use of those embossing folders. Thanks so much for playing along with us at OPUS GLUEI. Life IS a jungle, sometimes. Your card gave me a huge smile. Thanks for sharing! I love that you used a spidey folder for something other than Halloween! VERY clever. I love your whimsical little "No Lion" phrase. It gave me a chuckle right off. And the scene is set with flair and attention to detail. i'm glad I got to see it and your blog! Just an all around terrific card, you really have a great eye for composition and the little touches that make your cards so perfect. Thank you so much for taking on the Opus Gluei challenge! Beverly this is an awesome interpretation of the sketch! The animals are adorable and the mosaic embossing on the gator is fabulous! Thanks for joining us at Tuesday Morning Sketches. Too cute! And love the embossing folder use too. Fab card. Thanks for joining us at Shopping Our Stash! Love the way you used texture in this card! The alligator looks especially fab!